Drivers choosing between the 2019 Volkswagen Tiguan vs the 2019 Toyota RAV4 will want to compare both vehicles’ available trim levels, total seats, technology features and storage space. For the convenience of drivers trying to decide between the two, we’ve done all the research and have put together a comparative analysis and table down below. 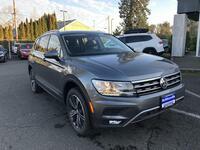 The 2019 Volkswagen Tiguan gives drivers more available seats and trim level choices than the 2019 Toyota RAV4. 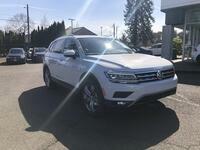 The 2019 Tiguan is available in six trim levels: S, SE, SEL, SEL R-Line, SEL premium and SEL Premium R-Line. The 2019 Toyota RAV4 only offers five: LE, XLE, XLE Premium, Adventure and Limited. 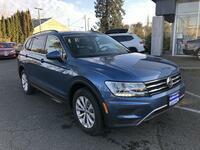 The 2019 Tiguan also has seven available seats, while the 2019 RAV4 only offers five. 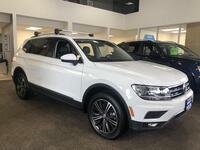 Although Apple CarPlay is supported by both the 2019 Volkswagen Tiguan and the 2019 Toyota RAV4, Android Auto is only available for the 2019 Tiguan. Other standard 2019 RAV4 technology features include Bluetooth audio streaming, a 6.5-inch touchscreen display and a USB port. The 2019 Volkswagen Tiguan also offers a bit more storage space than the 2019 Toyota RAV4. 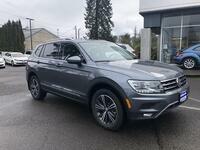 The 2019 Tiguan has a maximum cargo capacity of 73.5 cubic feet with all of its rear seats folded down. The 2019 RAV4 isn’t quite as spacious, only providing drivers with 69.8 cubic feet of maximum cargo capacity. 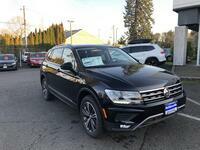 Available 2019 Volkswagen Tiguan security and safety features include: A crash-optimized front end, an intelligent crash response system, a tire pressure monitoring system, LATCH child seat anchors, emergency braking assistance, dusk sensing headlamps, traction control, an engine immobilizer, daytime running lights and dual front side-mounted airbags.